I am just a simple man. But even simple men must stand up for and defend Truth as best they can. It is disheartening to see how many still think there is some way for our political and religious leaders to compromise their way out of the recently promulgated unconstitutional infringement on the right to the free exercise of our religious beliefs. There is such a thing as Absolute Truth – Truth that is not and cannot be subject to negotiation or compromise. Among these absolute Truths are that abortion (surgical and chemical), artificial contraception, and sterilization are, and always will be, intrinsically evil acts. Our Creator demands that we stand up for the dignity of all human life, from the moment of conception to natural death. He offers no loopholes. No government can legitimately require any individual, directly or indirectly, to engage in, pay for or otherwise support any intrinsically evil act. If people, in the exercise of their free will, choose to ignore God, let them do so at their eternal expense and with their own resources, not from the monies the government takes from you and me. “This includes,” notes this courageous Shepherd, “every businessman or woman who willingly provides health insurance to his or her employees. It includes every single mother, every married couple and every individual who does not wish to cooperate in this sin. No one should be required to betray their religious and moral beliefs or violate their conscience”. We cannot and should not put our hopes in a possible administrative, legislative or judicial solution to this attack on our God given freedoms. I am not opposed to engaging those venues and attempting to persuade them to do what is morally and constitutionally right. I commend those Catholic institutions and individuals that have already entered that battle field. But those processes take time, are costly, and uncertain in their outcomes. They are institutions of men and women, not of our sovereign God. As such, we must also ignore them if they direct us to violate our religious beliefs and our moral consciences. So from this point forward, we must proclaim unceasingly that when it comes to any attempt at any level of government to require any Catholic to abide by any law, rule, or regulation that is inconsistent with the teachings of the Catholic Church, in one united, clear, unambiguous voice, the only response acceptable to God is: No! Never! 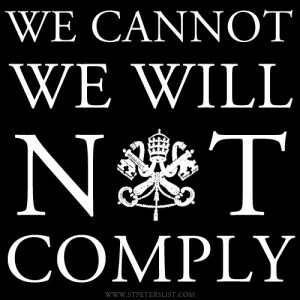 We will not comply! And if the Pharaohs in our midst still persist in trying to limit our religious rights and to impose their ungodly evil upon us, then they must know now that every Catholic sponsored health care program, every Catholic sponsored social and charitable program and every Catholic institution of education will close their operations, rather than act contrary to conscience and the tenets of our faith. If you are among the courageous Bishops who have already said No! Never! We will not comply! but know that there are Catholic colleges or hospitals or social service or charitable agencies or individuals within your jurisdiction who have opted to do otherwise, you can not remain silent and complicit with that evil. If you are among the courageous Bishops who have already said No! Never! We will not comply but have remained silent in the face of the public scandal caused by the actions of public and political figures who claim to be Catholic but support intrinsic evil, you must speak up publicly and let us know that you have ordered them not to present themselves for Holy Communion, and have directed all Eucharistic ministers and extraordinary ministers of the Eucharist not to distribute Holy Communion to any of these individuals, unless and until they have availed themselves of the sacrament of reconciliation and publicly renounced their support of intrinsic evil and announced their commitment to obey God rather than man. If you are among the courageous Bishops who have already said No! Never! We will not comply! but have priests who have refused to read your recent messages calling their parishioners to arms, you must not remain silent with respect to such defiance. If you are among the courageous Bishops who have already said No! Never! We will not comply but have never directed your priests to instruct their people on the Church’s teachings on abortion, contraception and sterilization and the reasons for such doctrine, you must have them do so now. If you are among the courageous Bishops who have already said No! Never! We will not comply, then you must call all men, women and religious leaders who treasure religious freedom to assemble in our nation’s capitol and in our states’ capitols, on the same day and at the same hour and join their voices with yours. If you are among the courageous Bishops who have already said No! Never! We will not comply, then you must leave your administrative offices, lead your people in peaceful public protest and be prepared to be jailed for defending the Truth. You have, and rightly so, declared war against those who dare infringe upon our moral consciences and our right to practice our religious faith, and who are trying to limit our religious rights to merely a right to worship, intending thereby to prevent us from witnessing to the Truth of God in the public square. We must and will win this war – not by our own abilities but by the grace of God and through the prayer, sacrifices and sufferings our Lord is calling us to endure. The invisible on-going unseen spiritual war between good and evil is manifesting itself in the physical realm. This is a war for the salvation of souls. Do not turn back! Do not retreat! Do not compromise! Do not look for loopholes around God’s Absolute Truth! There are none. Watch out when simple men speak. Others can not be far behind.